Sunday morning my friend, Mina, accosted me in the changing room at the beach. “There’s an ocean swim here, today and I really want to do it. Will you do it with me Shan?” was pretty much her question. Mina is a remarkable woman. 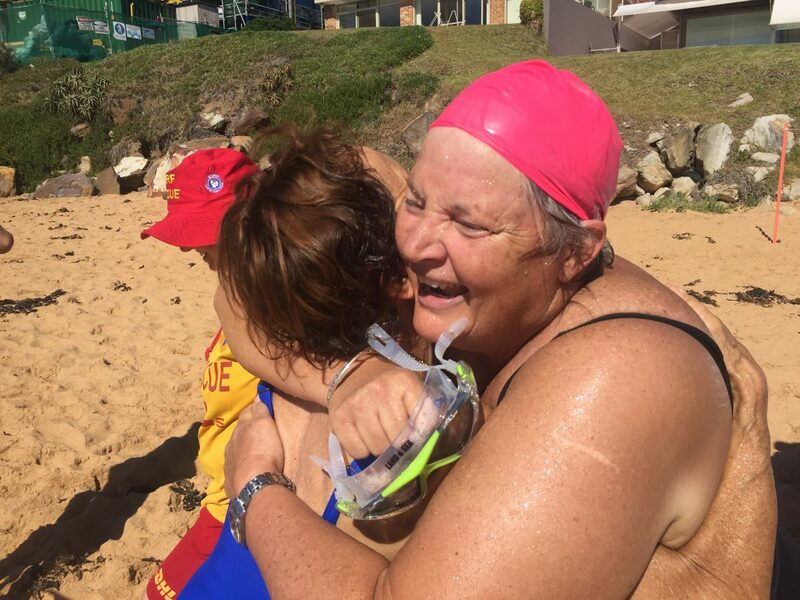 After retiring and moving near the beach, she decided that she wanted to learn how to swim. Using YouTube videos and later, advice and demonstration from other regular swimmers, Mina now swims in the bay every day. 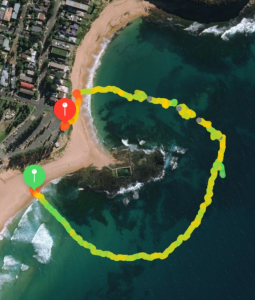 In the space of eleven months, Mina has gone from never having swum before to now, entering an ocean swim race. The race was at our local beach. It was a short one – only 900 metres. It was the first time this particular swim had been put on the program. Mina knew she’d regret it if she didn’t try. Sunday morning, in the shed, was the first time I’d heard about it. I’ve never done an ocean race before. I don’t like swimming in the churn that comes with crowds. I hadn’t prepared in any way for this event. Mina’s question came out of the blue. Out in the bay a few minutes later, I? thought, “Why not?” I had nothing to lose and in fact, it would be fun and a challenge for me too. I also knew that Mina would feel more confident with me there and she really wanted to do it. 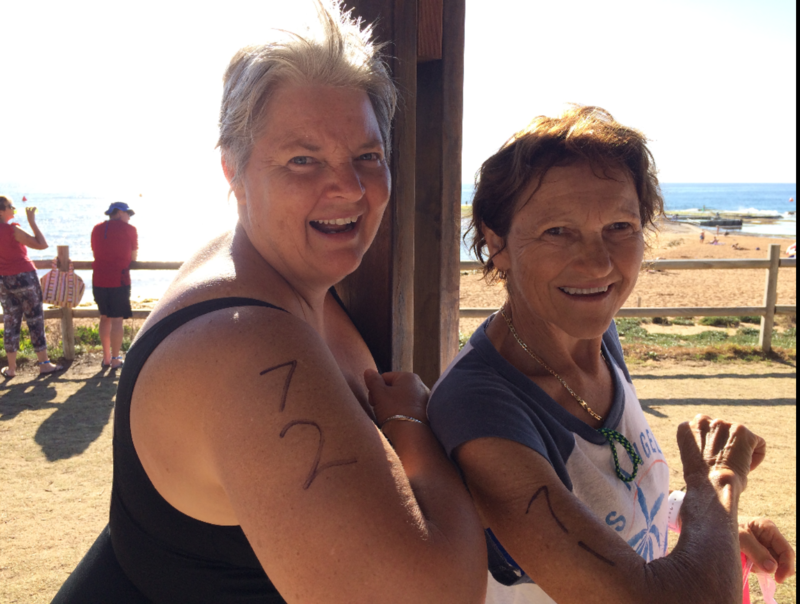 We signed up, received our swimming caps, had timers strapped to our ankles and numbers written on our arms – 71 and 72. Sometimes it’s better to just jump right in without thinking about it too much. ?Spontaneous action is often fun and even though the outcome might be unclear, the journey can teach a lot. Despite struggling a bit and being out of her depth, Mina wasn’t going to give up for anything. Several times the lifeguards offered her a lift on their boards but she was busy admiring the view, incredulous that she was actually out there! About 300m in, I was tiring and struggling for breath.? I realised that I had to swim at my own pace, to my own breathing pattern to keep going. Instead of staying with Mina, breathing too often and too fast, I swam ahead and then stopped to wait for her. My short, fast breathing had caused a stress response, making me more breathless and tired. By slowing my breathing and lengthening my stroke, I was able to stay strong and calm. When we first saw the buoys we had to swim around we said to each other, “Surely we swim inside them!” It looked a really long way. Once we were on our way, those buoys looked even further away. When we were out the back, way past the rock platform, the distance looked endless. Each time, we just kept swimming towards the next one. Having a support crew and cheer squad makes all the difference! About half way around the course, Mina and I were lagging behind most of the other swimmers. We were going slowly and the lifeguards started offering to help. As we approached the turn to go back into the bay, I told them Mina’s story. I asked them to stop offering her help because she wasn’t going to accept it unless she was dying. From that point, they started cheering. All the way to the finish line and beyond they cheered us on. The icing for us was that our swimming buddies, The Buckettes, were also there to welcome us back! We’ve been treated like celebrities and it’s fun! ?We are still smiling and talking about it.